Measuring results is important to improve the performance of your sales and essential to achieve success. But what are the best performance indicators? Take a look at the article and discover the 4 essential performance indicators for sales managers. The number of leads that you generate every month is a very important indicator. Not only you should analyze the amount of leads but also how you get them. With this analysis you can detect how you are generating leads and define a strategy accordingly to your reality. Sales managers are increasingly coming to the conclusion that to increase their sales, they don’t need more sellers but more leads. Sales opportunities represents the number of presentations or proposals you sent to a qualified lead. Here you should not consider the same email you sent to 100 people you have on your list, but the sales opportunities you had, based on actual needs. This indicator allows you to get a real view of the opportunities you generated in a given month and evaluate the value of each. The conversion rate is the number of new clients, divided by the number of qualified leads. With this indicator you can have an estimate of how many leads can become clients. This way you can understand what is the direction of your sales. Allowing you to adjust and refine strategies. Now it is easier analyze your sales and boost their growth. Do you already use a tool that have these analyses? If you don’t. 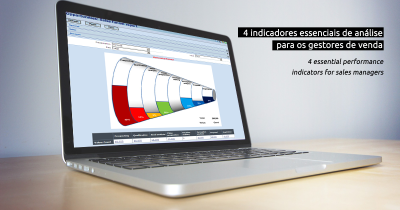 Learn more about exact synergy, that allows you to work with these indicators and much more. To know more information, please contact us. Go further, go with kwalit.